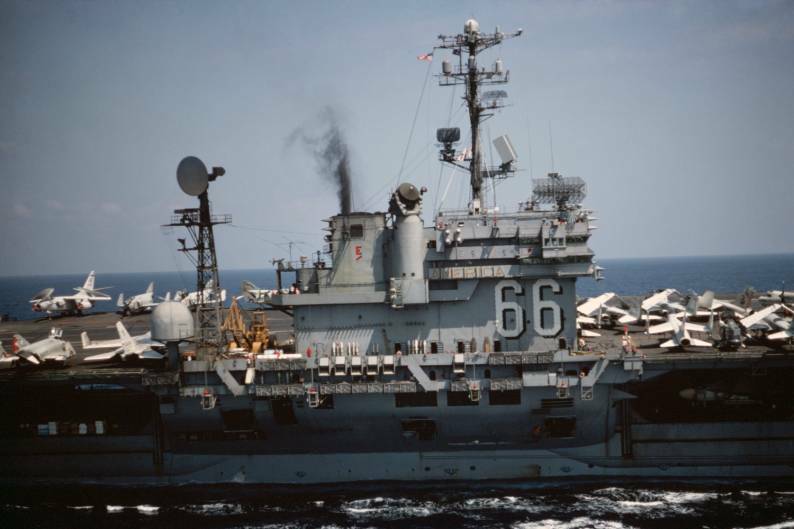 From 28 November to 15 December 1966, America took port in "LANTFLEX 66," gaining experience in the areas of antiair antisubmarine, and carrier strike operations. 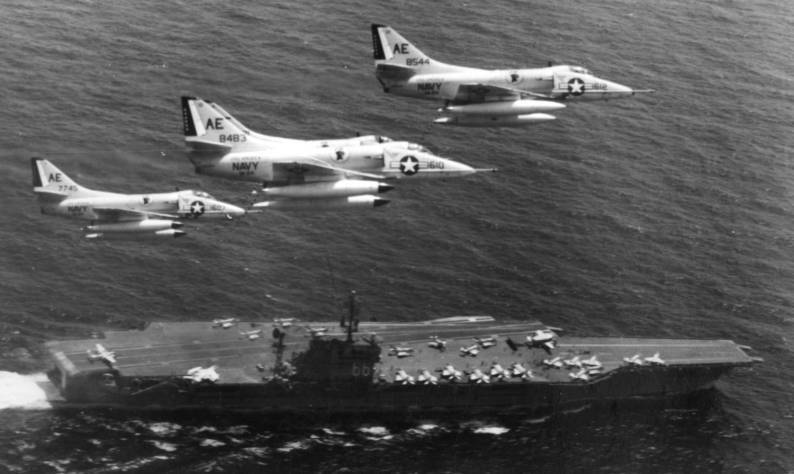 The ship also participated in a mine drop, missile shoots, and provided air support for am phibious operations. She returned to NOB Norfolk on 15 December, remaining there through the end of the year 1966. 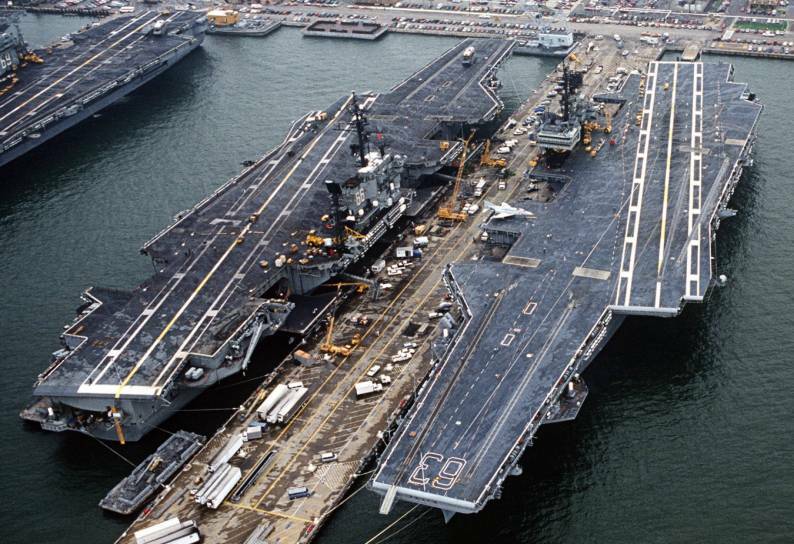 The beginning of March 1967 found America and her consorts, operating as Task Group (TG) 60.1, participating in the United States/United Kingdom Exercise Poker Hand IV with the British aircraft carrier HMS Hermes. America and Hermes provided raid aircraft to test each other's antiaircraft defenses. 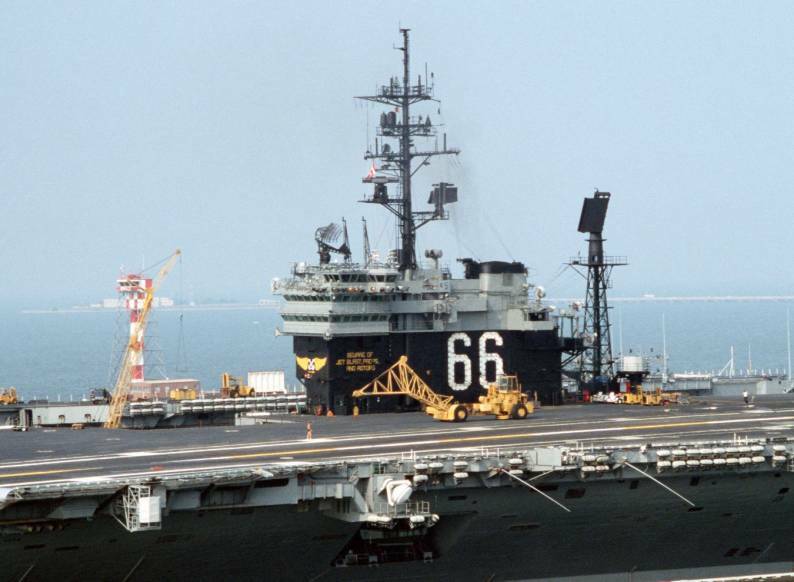 America moored at Pier 12 Naval Station, Norfolk, on 20 September 1967 and entered the Norfolk Naval Shipyard on 6 October. 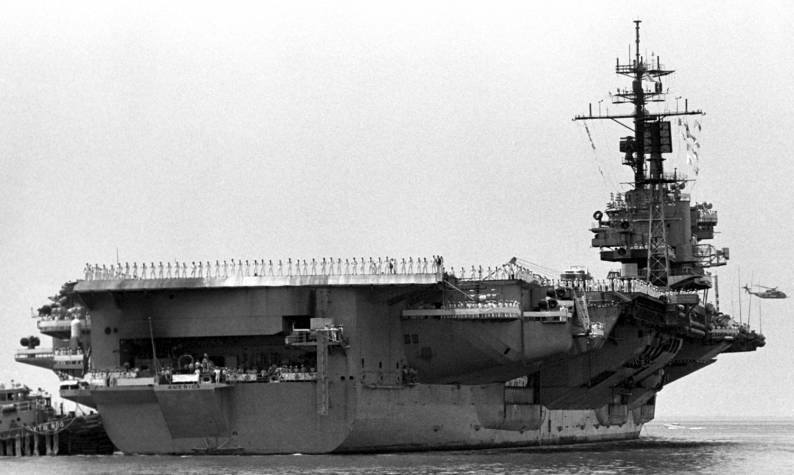 She remained there, undergoing a restricted availability, into early January 1968. 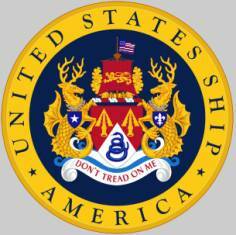 From 6 to 8 January, the ship steamed for three days of sea trials in the Virginia capes operating area. After a four-day ammunition onload at Anchorage X-ray in Hampton Bay and a brief stay at Pier 12, NOB, Norfolk, America departed for a month-long cruise to the Caribbean for the Naval Technical Proficiency Inspection (NTPI), refresher training with the Fleet Training Group, Guantanamo Bay, and type training in the Atlantic Fleet Weapons Range (AFWR) before she could proceed to the Jacksonville Operating Area for carrier qualifications. 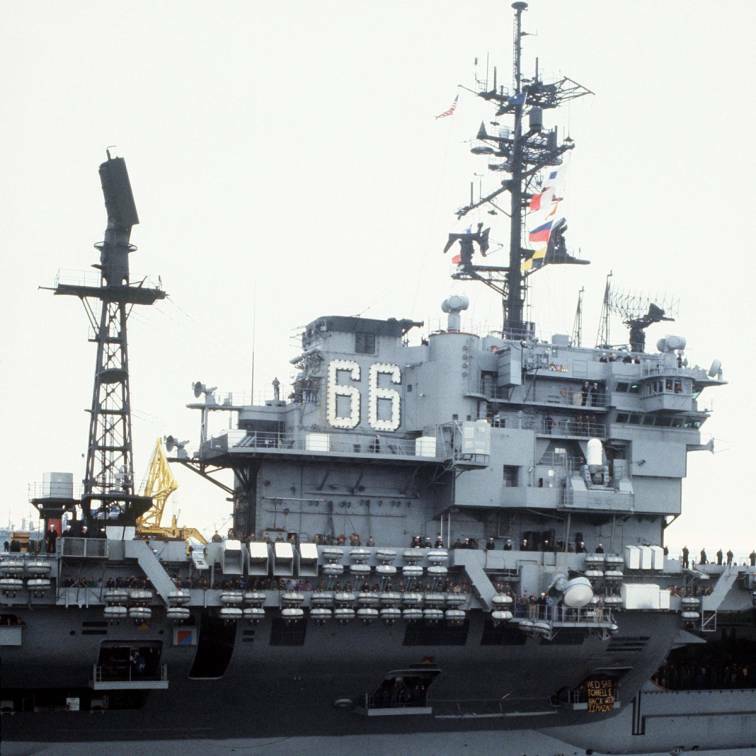 On 17 February 1968, America moored at berths 23 and 24 at Norfolk Naval Shipyard to prepare for final type training, prior to her upcoming WestPac deployment. On 7 March, America again put to sea, back to the AFWR for further type training and Exercise Rugby Match. Enroute to the Caribbean, the ship held various exercises in weapons loading, electronic countermeasures (ECM), and General Quarters. 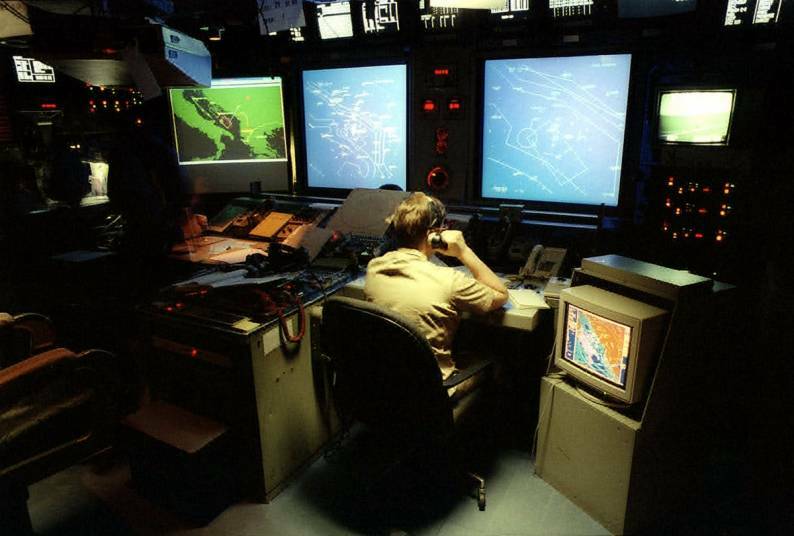 On 10 March, America flew off the first of eight simulated air strikes. America's CVW flew "attack" sorties against "enemy" positions on Vieques Island, near Puerto Rico. A search and rescue exercise (SAREX) was conducted to test the ship and air wing response to the distress call of a downed aviator. She also held several missile defense exercises to test the ship's reflexes against a surface threat. 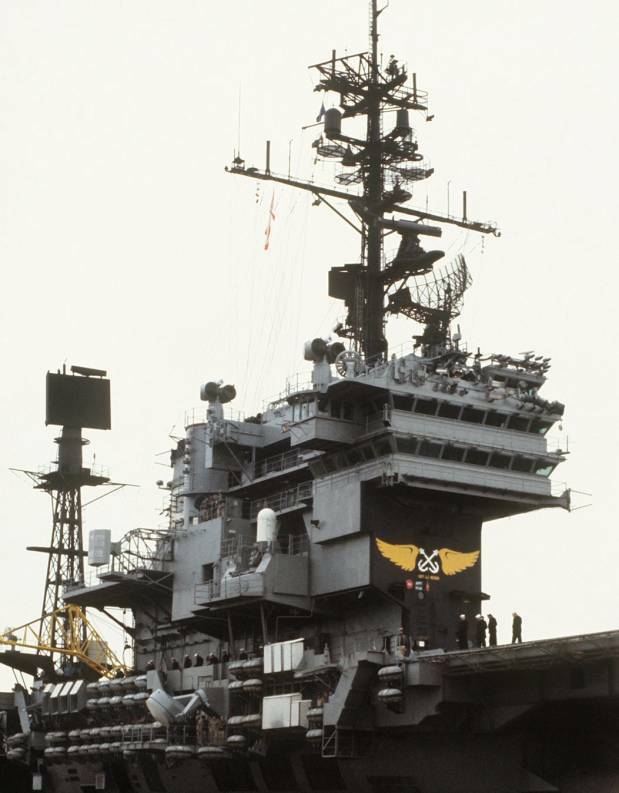 America moored at Pier 12 NOB, Norfolk, at 1315, 23 March 1968. Two days later, on the 25th, she put to sea again for a dependents' cruise. Then, on the dark, rainy afternoon of 10 April, America stood out of Hampton Roads, bound for "Yankee Station," a half a world away. 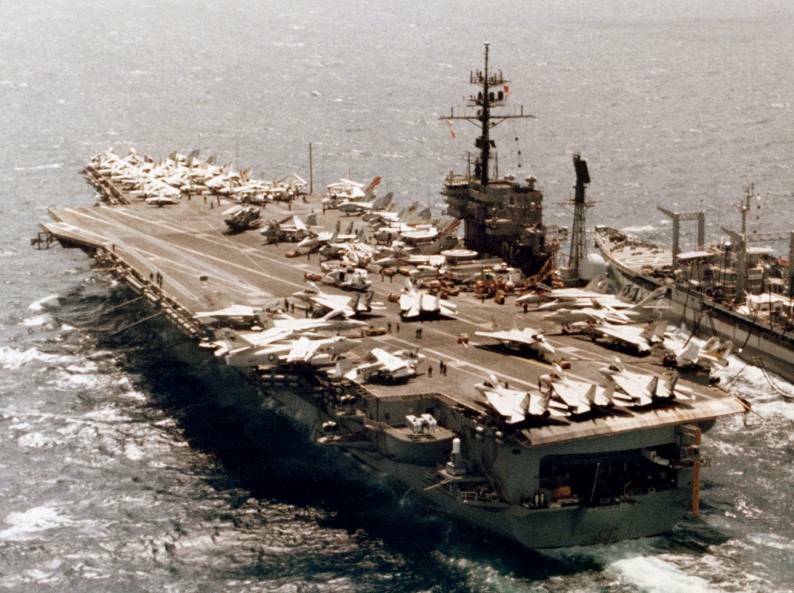 The next day, the ship's complement of men and machines was brought up to full strength as America recovered the remainder of CVW-6's aircraft off the coast of the Carolinas. En route, she conducted one last major training exercise. Rio de Janeiro, Brazil, was the next stop enroute to southeast Asia, America's first to that city and continent. Now with her course set almost due east, America sailed through waters she had never traveled before. Across the southern Atlantic, around the Cape of Good Hope, past Madagascar and out into the broad expanse of the Indian Ocean towards the Sunda Strait and Subic Bay, Philippine Islands. From Subic the ship sailed northwest through the South China Sea towards "Yankee Station." 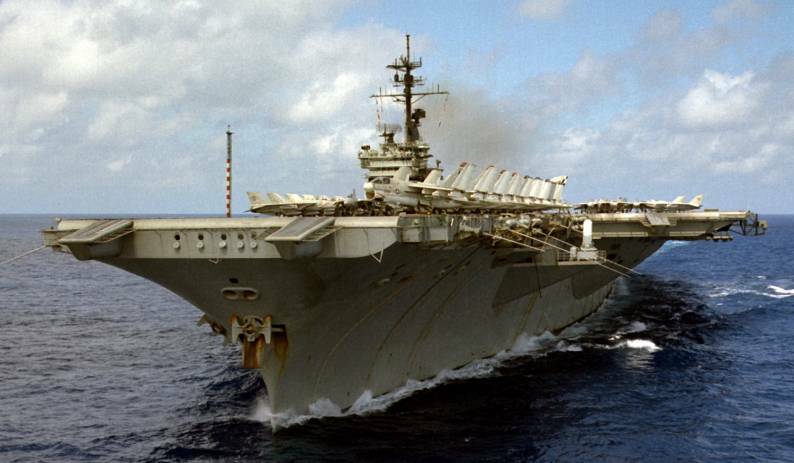 Shortly thereafter, on 8 January 1969, she headed for the Jacksonville Operating Area where she served as the platform for carrier qualifications. 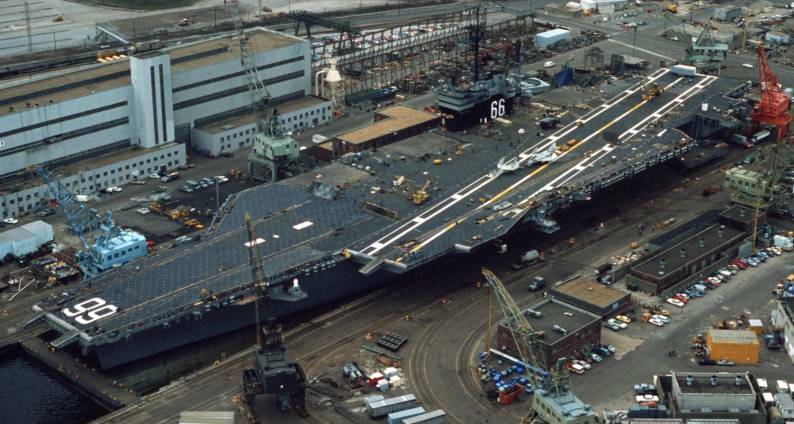 On 24 January, America arrived at the Norfolk Naval Shipyard to begin a nine-month overhaul. 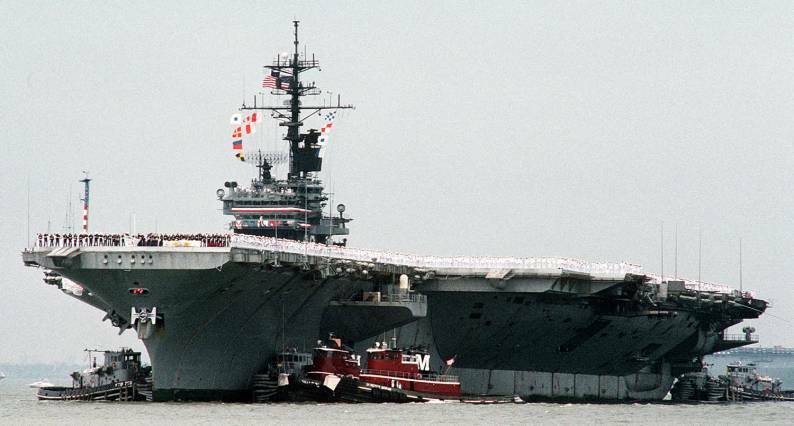 Upon completion of the overhaul, the carrier conducted post-repair trials and operated locally off the Virginia capes. 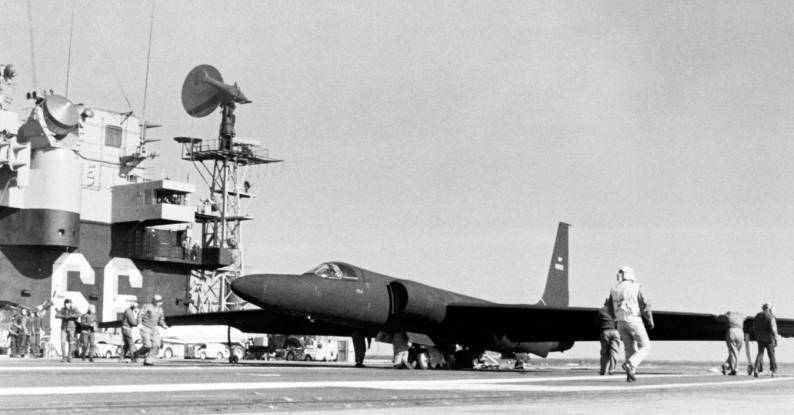 During one period of local operations, between 21 and 23 November 1969 America took part in carrier suitability tests for the Lockheed U- 2R reconnaissance plane. On 17 September, America completed her fourth line period and headed for special operations off the coast of Korea and subsequently, the Sea of Japan. On 23 September the carrier entered the Tsushima Straits, remained in the Sea of Japan for approx imately five days and exited on 27 September through the Tsugaru Strait. After rounding Cape Horn on 5 December 1970, America headed north, stopped briefly at Rio de Janeiro for fuel, and arrived at Pier 12, NOB Norfolk, on 21 December. 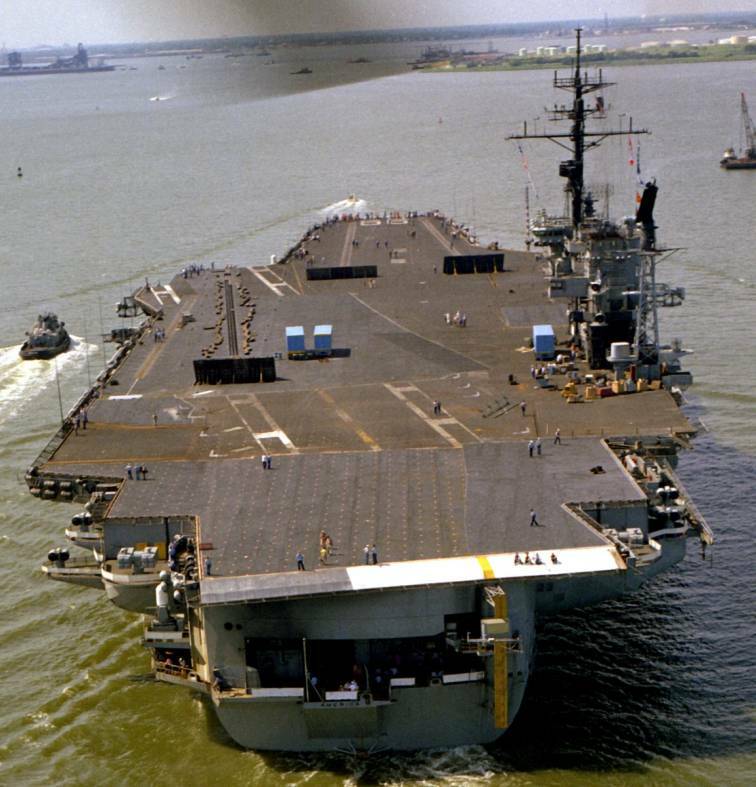 She remained there until 22 January 1971, when the ship entered the Norfolk Naval Shipyard for a three-month restricted availability. She departed the yard, on schedule, on 22 March. 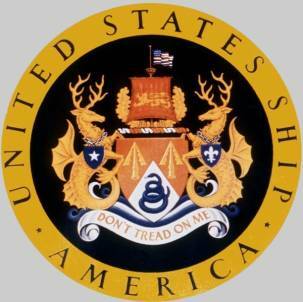 Over the ensuing weeks, the ship operated locally in the Virginia capes operating areas. 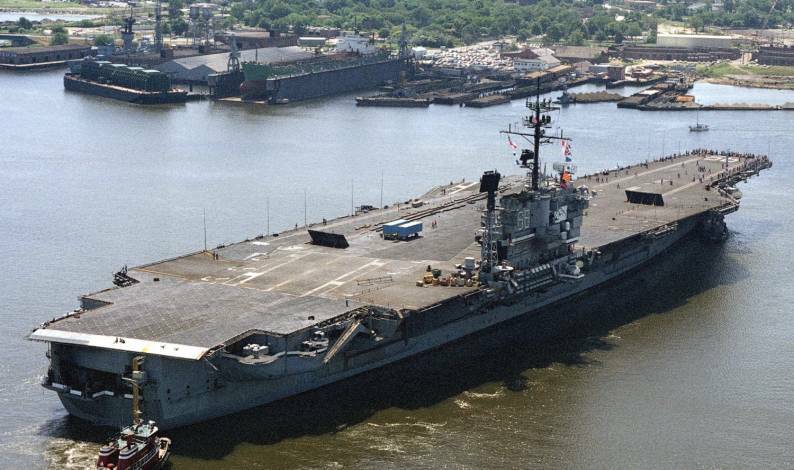 She then carried out exercises in Puerto Rican waters, with United States Navy as well as Royal Navy warships — including HMS Ark Royal (R-09), HMS Cleopatra (F-28), and HMS Bacchante (F-69). Following a port call at Naples, America proceeded on a course toward Palma, Mallorca. While enroute, she participated in "PHIBLEX 2-71," in which she covered a mock amphibious landing at Capoteulada, Sicily. After a port visit at Palma, Mallorca, America participated from 16 to 27 August in National Week X, one of the largest exercises conducted in the Mediterranean. During the exercise, on 26 August, an E-2B Hawkeye was flown by VAW-124 nonstop across the Atlantic. The Hawkeye left NAS Norfolk, Va., flew over Newfoundland, Canada, and Lajes, Azores. to reach America in the Med. At the termination of the exercise, America proceeded to Corfu, Greece, her next liberty port. She then visited Athens shortly thereafter. Arriving back at Norfolk on 16 December, America moored at Pier 12, NOB, Norfolk, for post-deployment standdown before unloading ammunition in preparation for availability at the Norfolk Naval Shipyard. 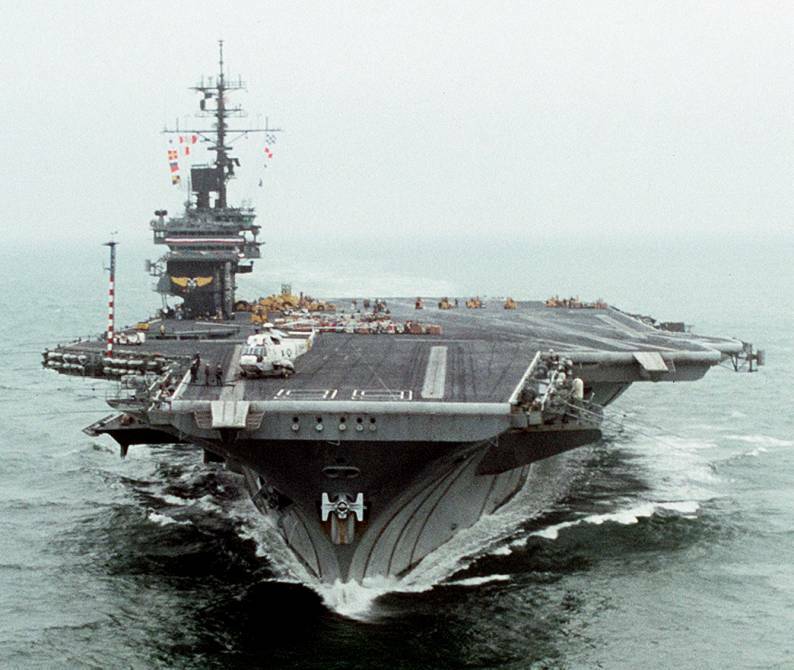 After the two-month overhaul, the carrier conducted sea trials. 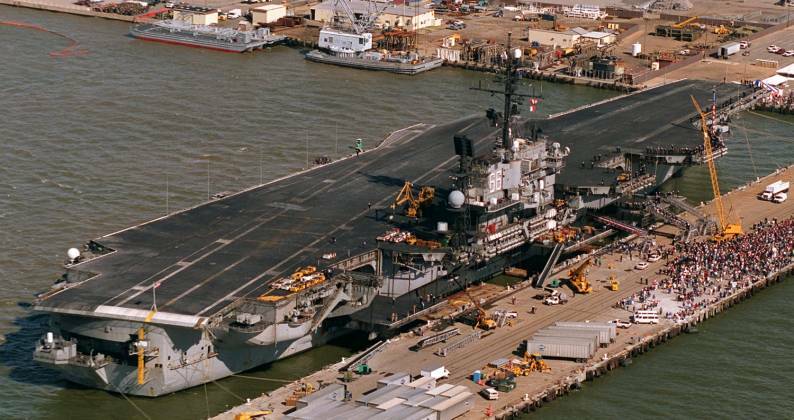 Soon thereafter, America embarked on a program of training, accelerated due to the fact that the date of her deployment had been advanced one month, and participated in Exercise Exotic Dancer V. She returned to Pier 12, Naval Station Norfolk, upon conclusion of the exercises. Escorted by USS Davis (DD-937) and USS Dewey (DD-937), and accompanied by the fleet oiler USS Waccamaw (AO-109), America proceeded toward southeast Asia, and rounded Cape Horn on 21 June. 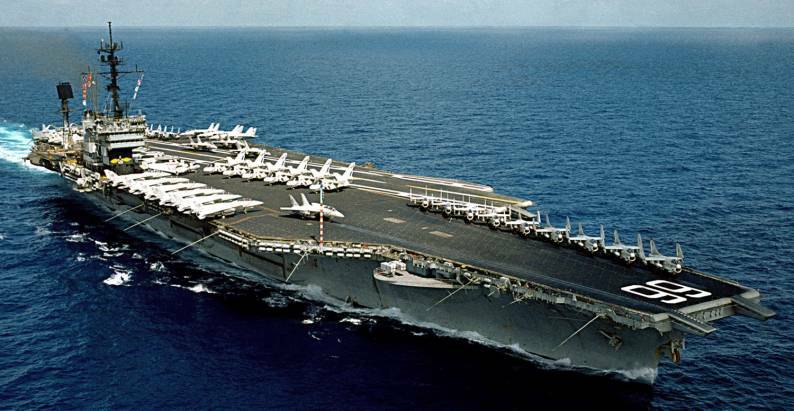 Joining the 7th Fleet later in June, America relieved the attack carrier USS Coral Sea (CVA-43) on station, and commenced combat operations on 12 July. 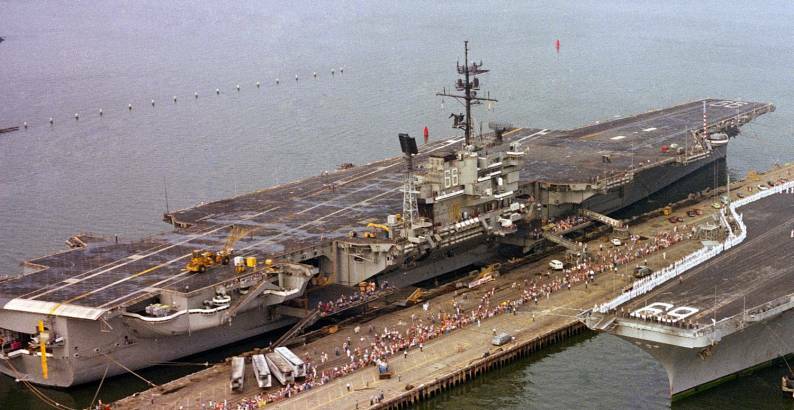 A ruptured main feed pump, however, prompted an early return to Subic Bay on 25 July for repairs, the ship arriving in the Philippines during a time of natural devastation — floods and landslides. 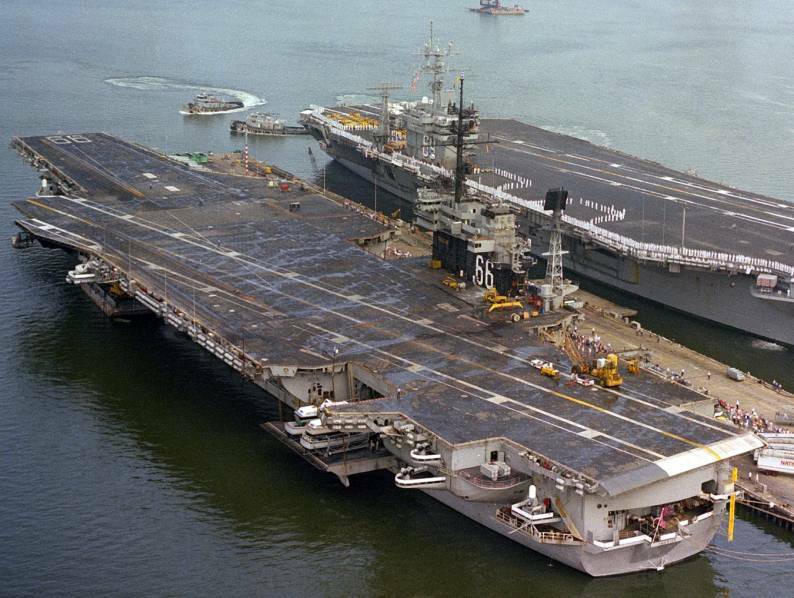 On 28 December 1972, the carrier anchored in Hong Kong harbor, and remained there until 4 January 1973, when she stood out for the Philippines and the period of rest and repairs at Subic Bay that would precede the ship's return to the line. All hands avidly followed the progress of the peace talks as America returned to "Yankee Station," and resumed operations. After two weeks on the line, the ship learned that peace had been secured and that an agreement was to be signed in Paris. 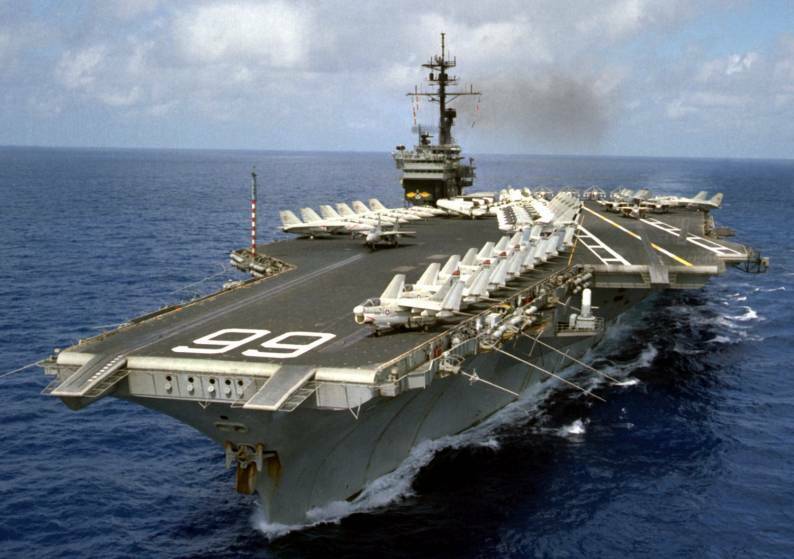 At 0800 on 28 January 1973, the Vietnam War — at least that stage of it — was at an end. 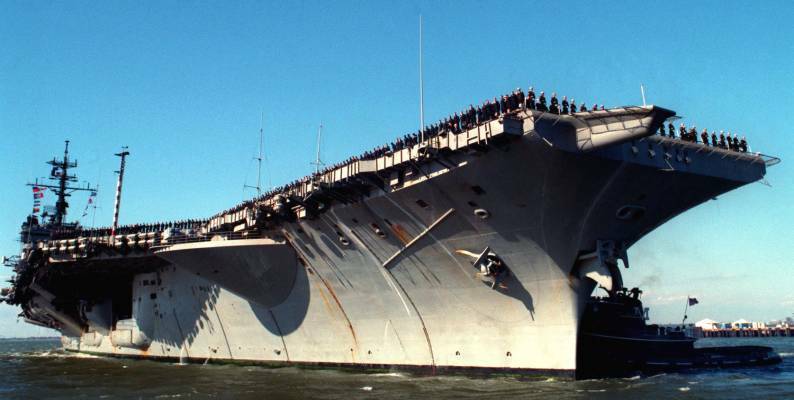 Rumors swept the ship that her deployment would be shortened because of the cessation of hostilities, and hope ran high as the ship moored at Subic Bay on 3 February. America did return to "Yankee Station" one last time, but her time on station proved short. 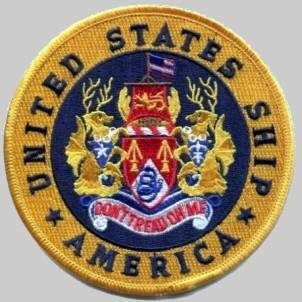 America was ordered to depart the Far East for the U.S. This was the initial move in reducing the number of carriers serving in Southeast Asia from six to three by mid-June 1973. 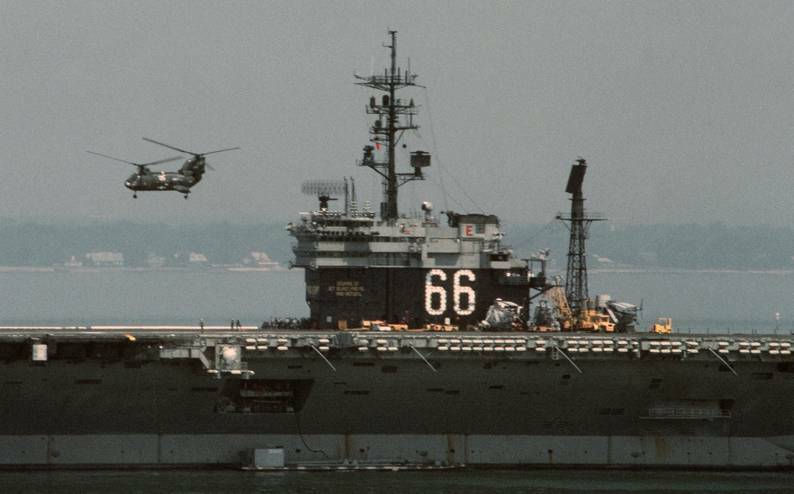 She returned to Subic Bay on 17 February 1973 and sailed thence for the United States three days later, on 20 February. 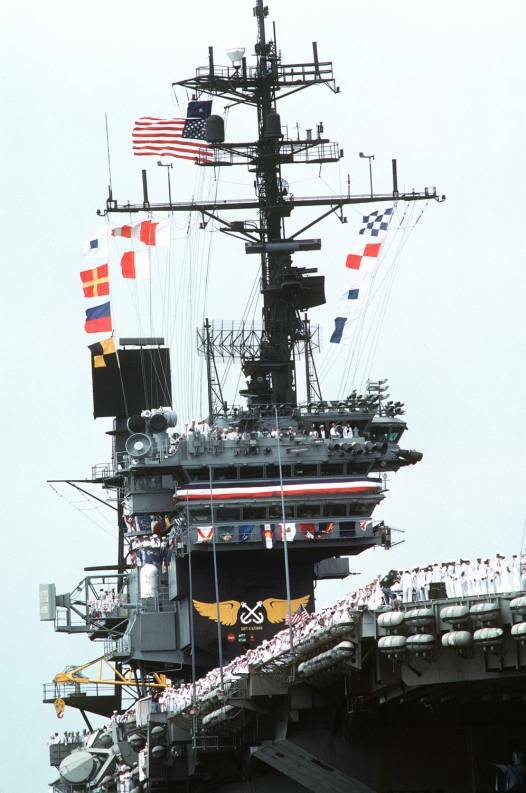 The carrier arrived at Mayport Fla., disembarking men from CVW-8 and embarking the teenaged sons of some of the ship's company officers and men, thus allowing them to ride the ship back to Norfolk with their fathers, something thoroughly enjoyed by all who took part. 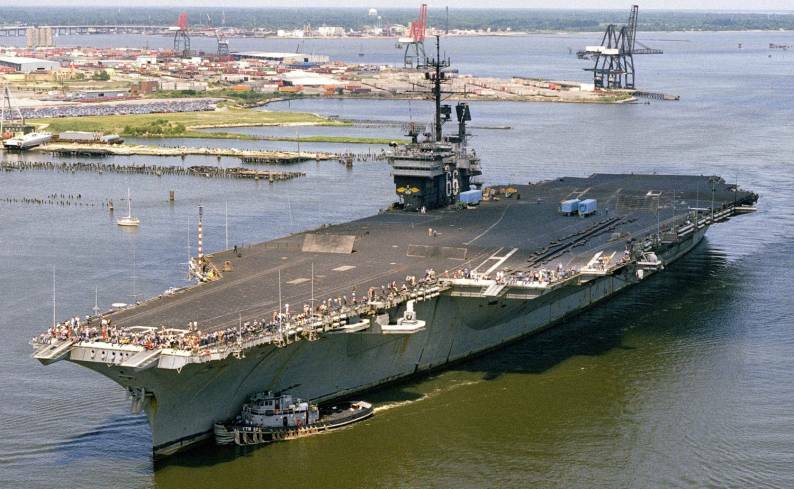 On 24 March 1973, America arrived back at NOB, Norfolk, mooring at Pier 12 and bringing to a close her sixth major deployment since commissioning. 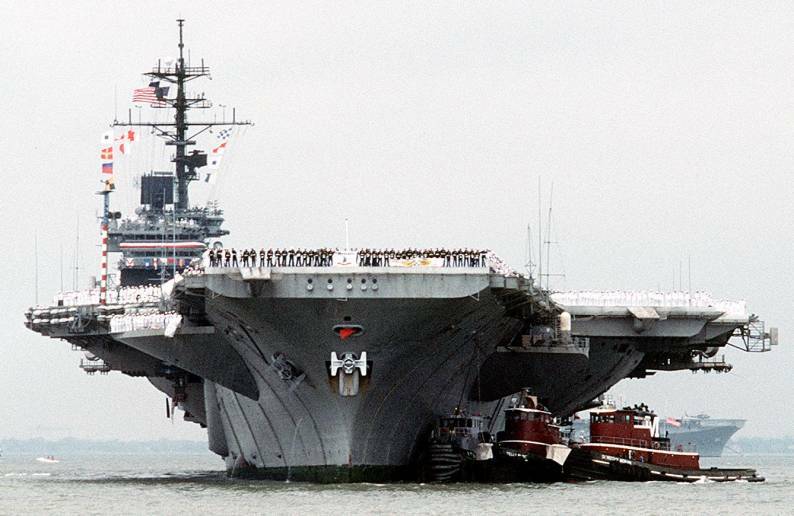 She immediately began preparations for a 30-day standdown and the restricted availability to follow at the Norfolk Naval Shipyard. She entered the yard on 11 May and emerged after that period of repairs and alterations on 10 August. 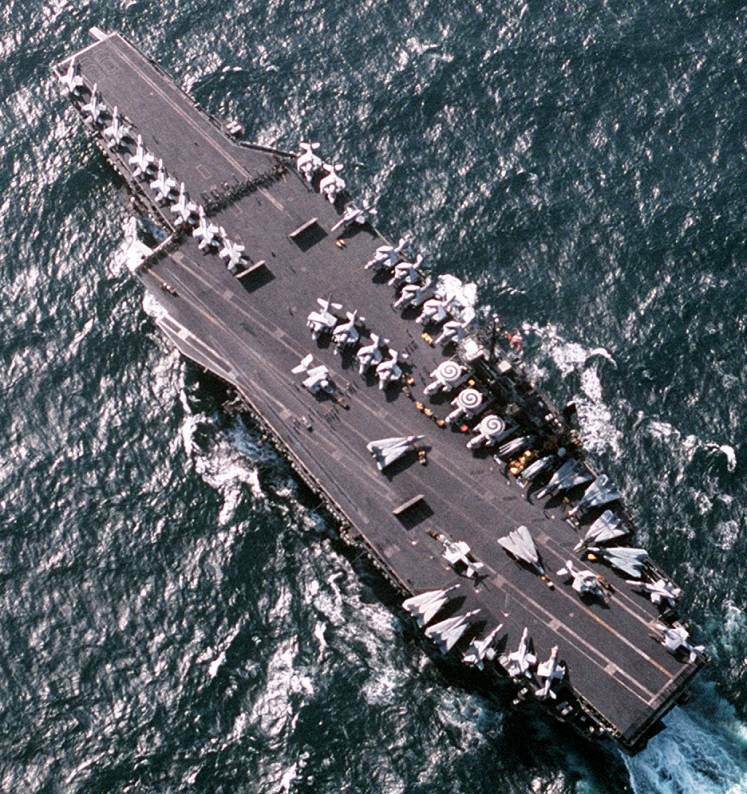 A little over a month later, America sailed for the North Sea, to participate in a NATO exercise, Northern Merger, departing Norfolk on 6 September 1974. 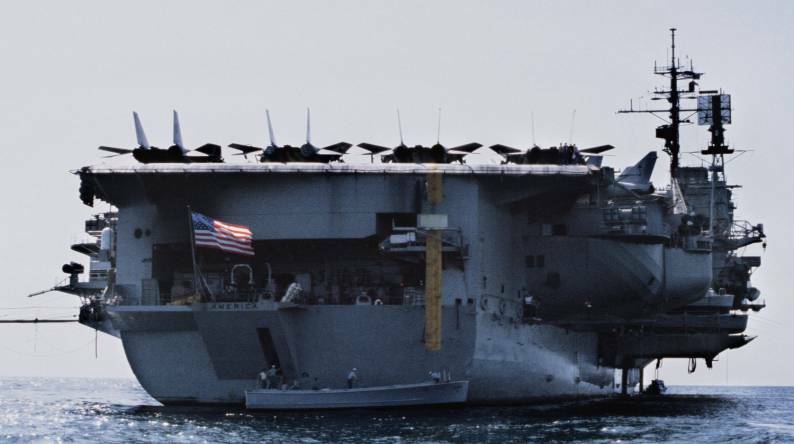 America joined with HMS Ark Royal in providing air support for a NATO task f orce and for an amphibious landing. Throughout the exercise Soviet surface units, as well as Bear and Badger aircraft, conducted surveillance missions over and near the NATO force. 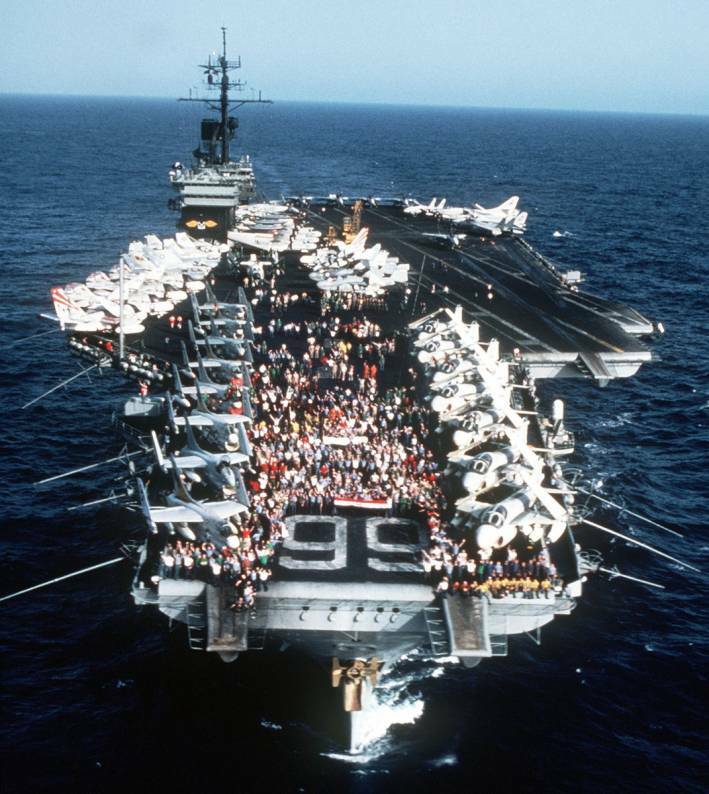 America completed her schedule of training in Cuban waters and then returned north, arriving back at Norfolk on 16 December 1975. 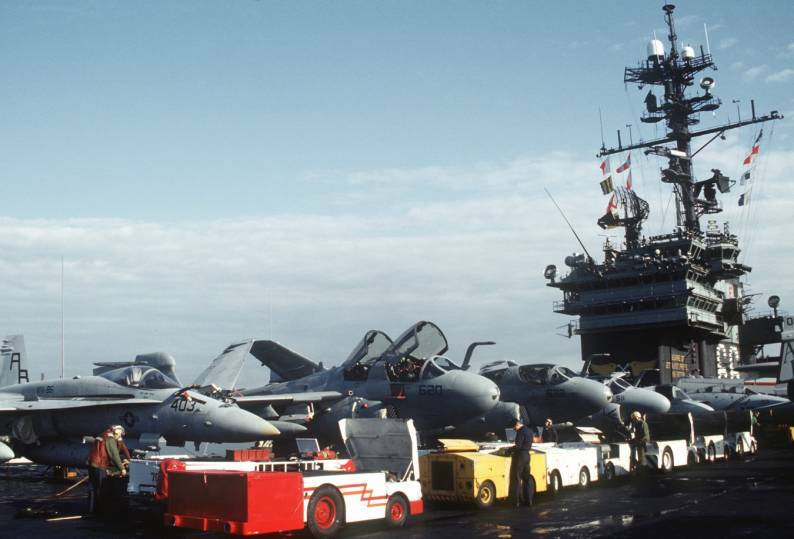 Following the year-end standdown, the carrier resumed local operations out of Norfolk in January 1976 and, in March participated in Exercise Safe Pass '76 with ships of the Canadian, West German, Dutch and British navies. 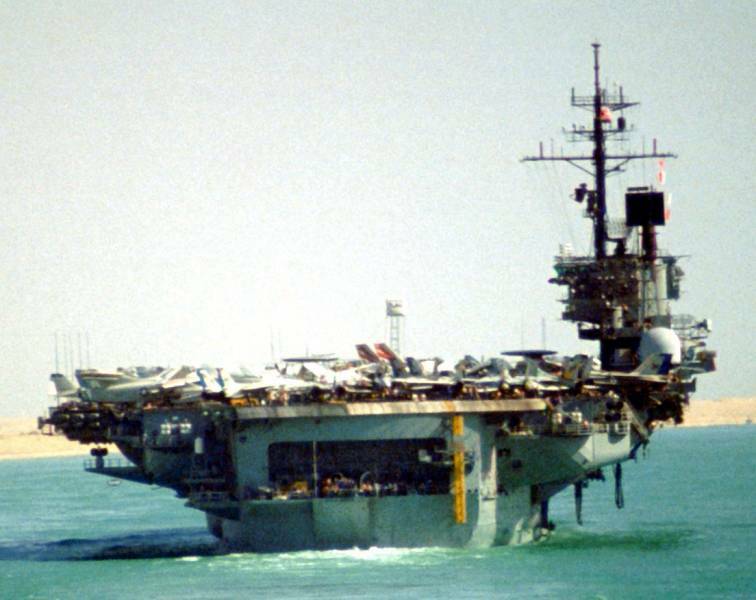 She ultimately sailed for the Mediterranean on 15 April 1976 with CVW-6 and Commander, Carrier Group (CarGru) 4, Rear Adm. James B. Linder, embarked. 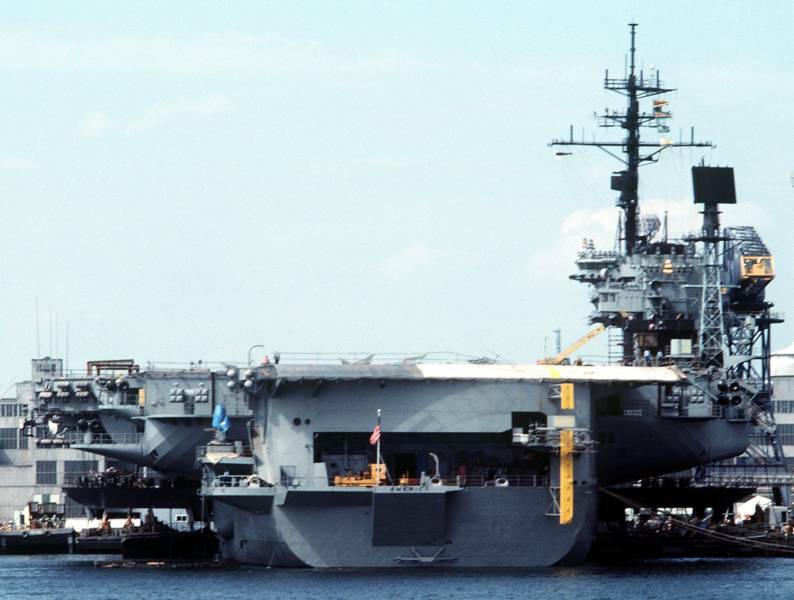 Following post-deployment standdown, America conducted carrier qualifications off the Virginia capes, and then entered Norfolk Naval Shipyard for an availability. 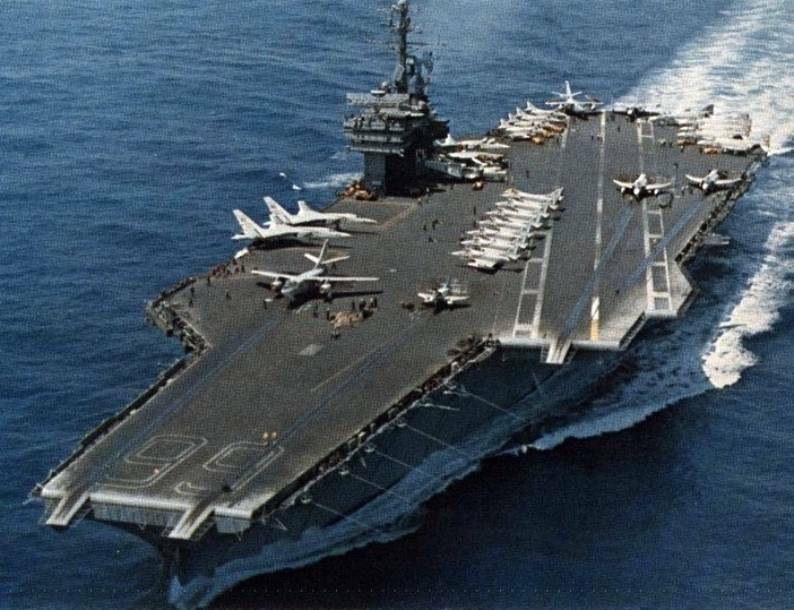 Upon the conclusion of that period of repairs and alterations, the carrier conducted post-availability sea trials on 19 and 20 September 1978, and conducted carrier qualifications with CVW between 12 and 20 October. 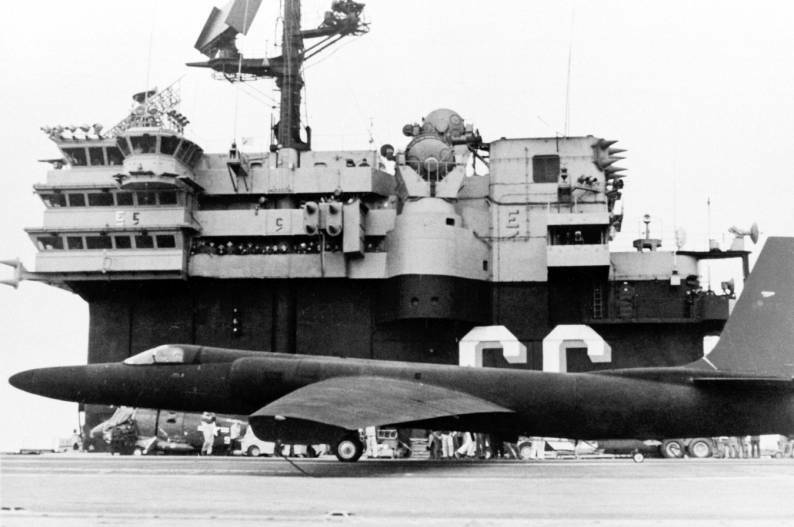 Tragedy marred the last day of operations, when a Grumman S-3A Viking antisubmarine aircraft went over the side upon landing; hung by the safety nets momentarily, then plunged into the sea soon thereafter. Although the pilots, Lt. Comdr. Ziolowski and Lt. (j.g.) Renshaw ejected clear of the plane, they were not recovered. Highlighting this period were numerous multilateral and unilateral exercises, as in previous Mediterranean deployments. During one phase of National Week XXVII, America and her consorts took part in an open sea exercise that took them into the waters of the Gulf of Sidra (Sirte) — claimed by Libya as territorial waters since 11 October 1973. The Libyan government serving notice that any ship or aircraft operating south of the 32° 30' north latitude would be violating its territory, America's battle group maintained an alert, in view of the proximity of Libyan airfields and Soviet-made aircraft operating therefrom. Departing Augusta Bay, Sicily, on 26 July 1979, the task group arrived in its exercise area on the 28th. 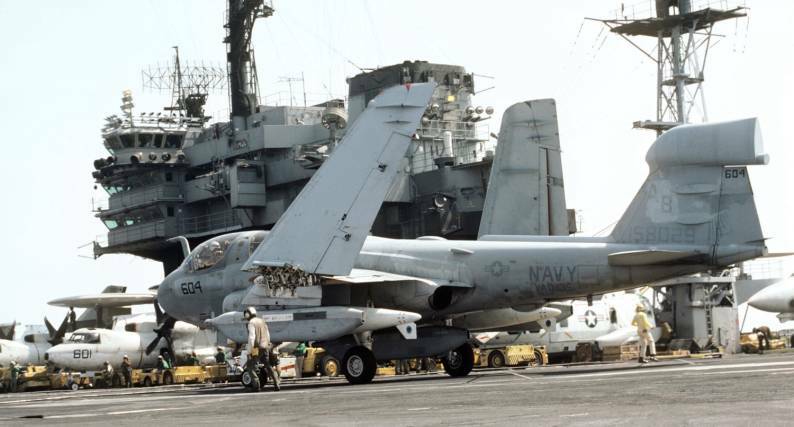 As planes from CVW-11 maintained nearly continuous fighter cover, the ships conducted their exercise unhindered. 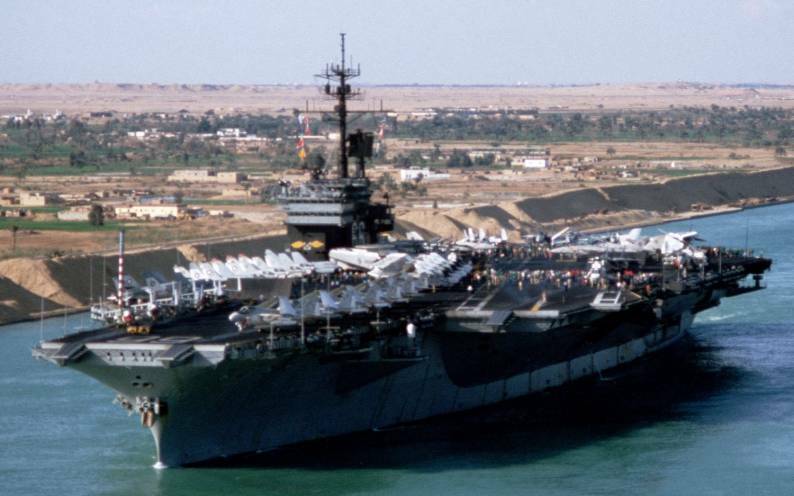 Originally scheduled to have commenced her transit of the Suez Canal on 5 May 1981, the tense situation in Lebanon prompted a 24-hour "hold" on the evolution. 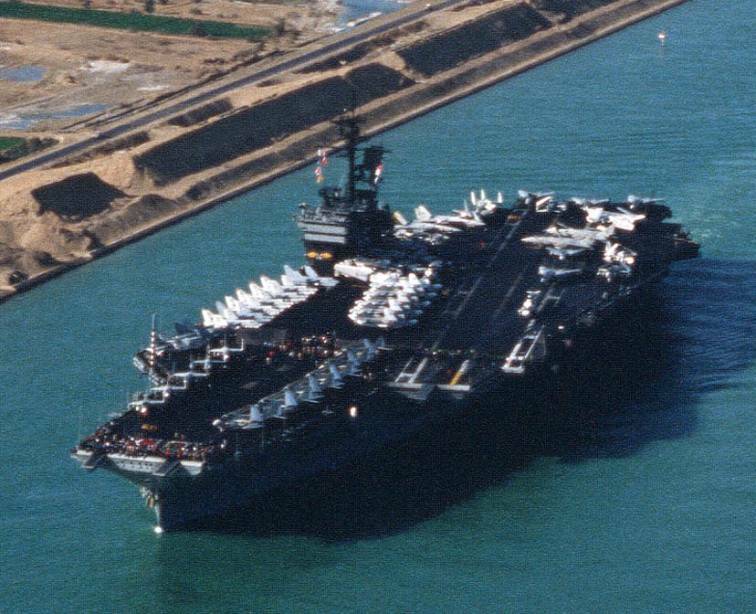 Given the go-ahead soon thereafter, America made the 104½ mile transit on 6 May, in ten hours — the first United States Navy carrier to steam through the Suez Canal since USS Intrepid (CVA-11) had made the passage shortly before the Arab-Israeli "Six-Day War" of 1967. 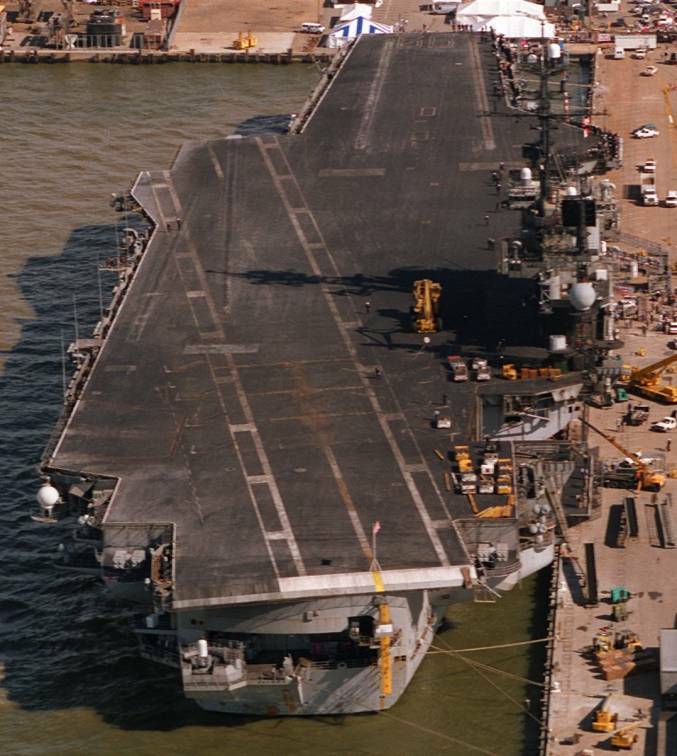 It was also the first "supercarrier" to transit the canal since it had been modified to permit passage of supertankers. 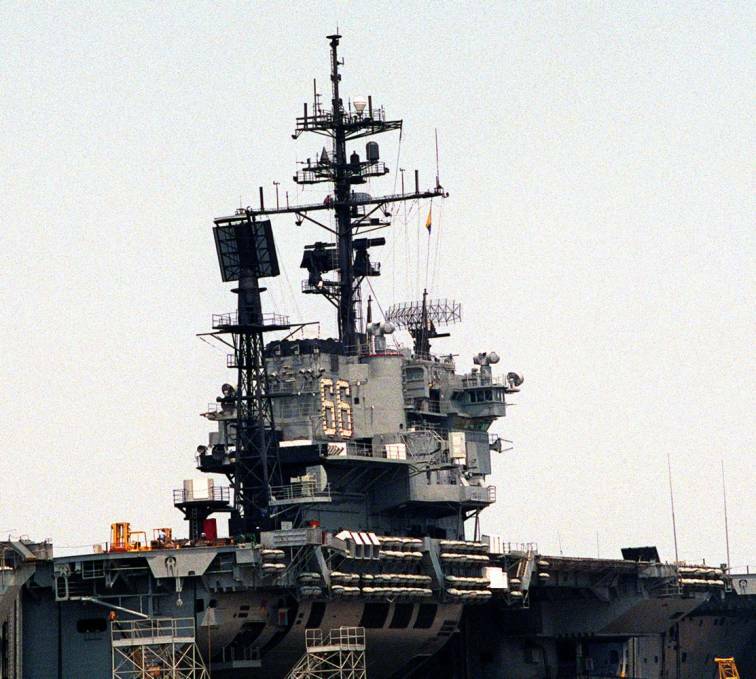 Following a short standdown, America conducted carrier qualifications in the Virginia Capes operating area, before she moored at the Norfolk Naval Shipyard on 14 December. Emerging from the naval shipyard on 20 April 1982, America operated locally off the Virginia Capes. Departing Norfolk on 10 May, the ship steamed to the Guantanamo Bay Operating Area and returning to her home port on 28 May. Late on 23 March, American planes flew south of latitude 30° 30' N. — the "Line of Death" proclaimed by Libyan leader Muammar Qaddafi. On 24 March, USS Ticonderoga (CG-47), accompanied by two destroyers, USS Scott (DDG- 995) and USS Caron (DD-970), moved south of the "Line," covered by fighter aircraft, at 0600. 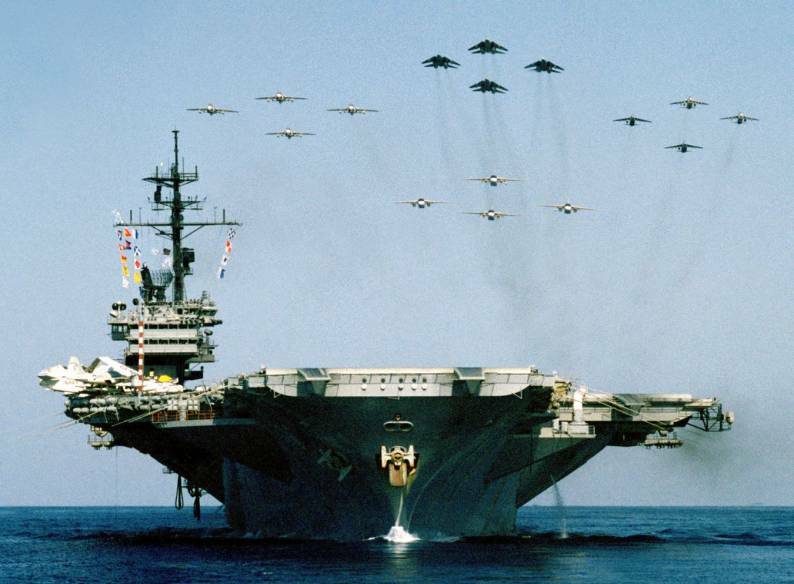 America spent the first part of 1990 conducting local operations. 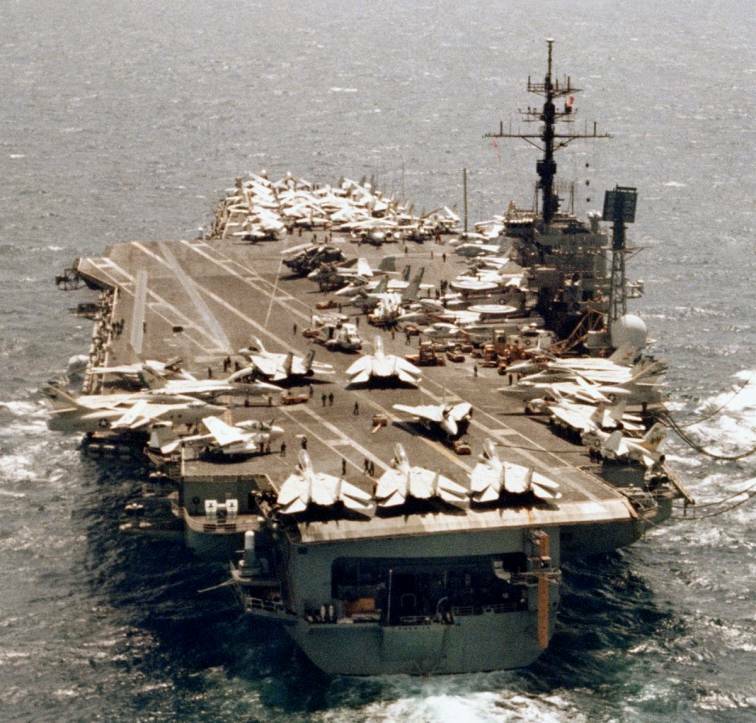 After a three-and-a-half month shipyard availability, America conducted Refresher Training, Advanced Phase Training and FLEETEX prior to deploying five months early in support of Operation Desert Shieldon 28 December 1990. 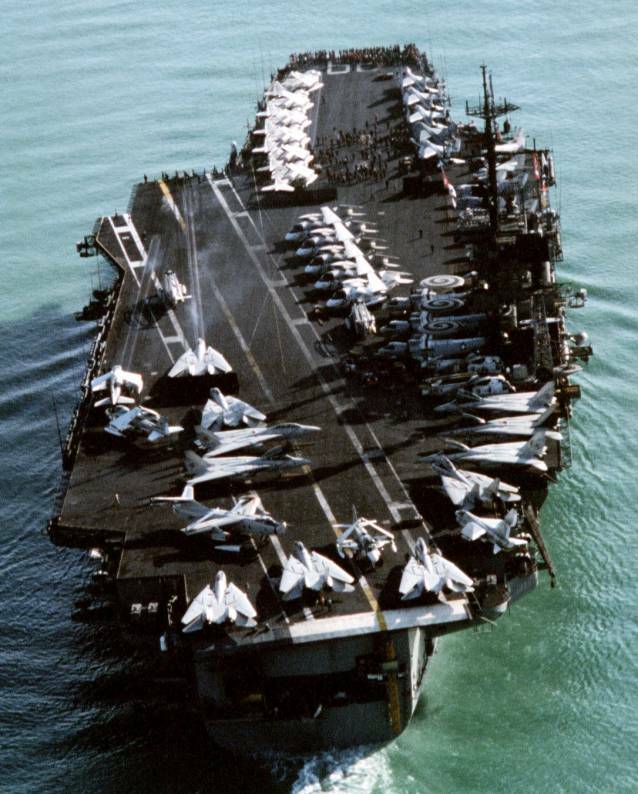 America transited the Straits of Gibraltar on 9 January 1981, and on 15 January, the America battle group transited the Suez Canal and arrived on station in the Red Sea to participate in Operation Desert Storm . 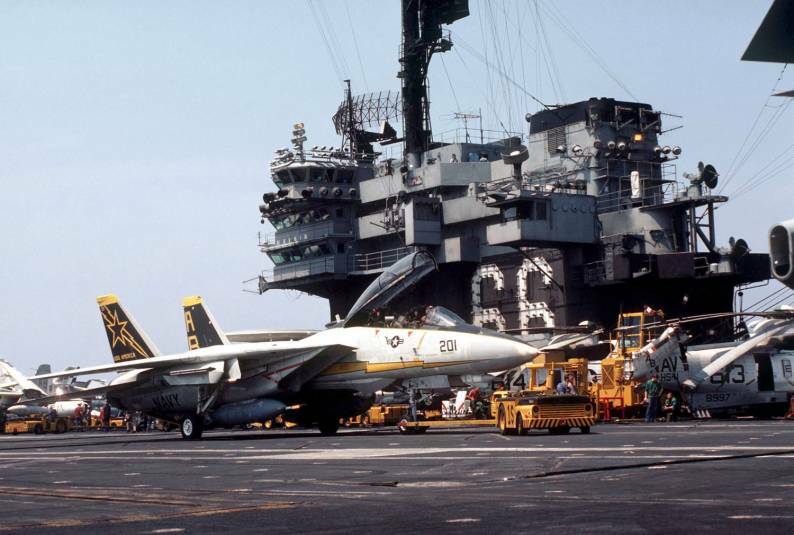 While deployed, the America/CVW-1 team distinguished themselves, on 15 February, as the only carrier and air wing to fight in both the Red Sea and Arabian Gulf. On 20 February, America's VS-32 became the first S-3 squadron to engage, bomb and destroy a hostile vessel — an Iraqi gunboat. 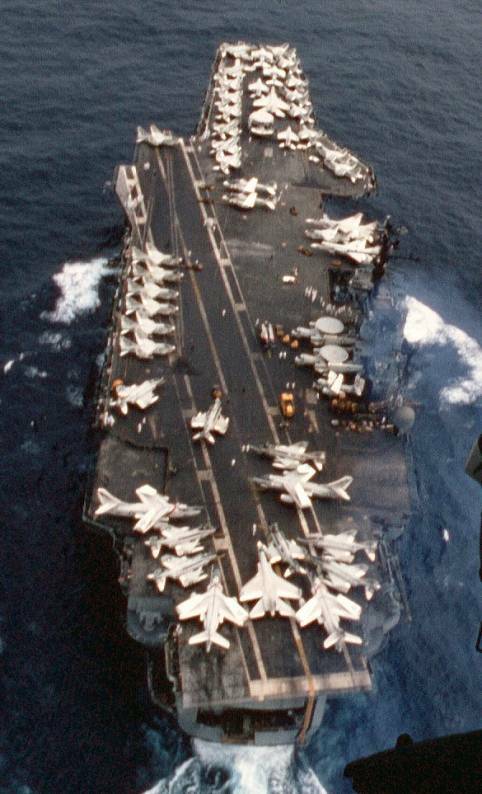 America visited the capital city of Valletta, Malta, 23 through 28 January 1996 — the first U.S. Navy carrier to visit this historical port in over 24 years. 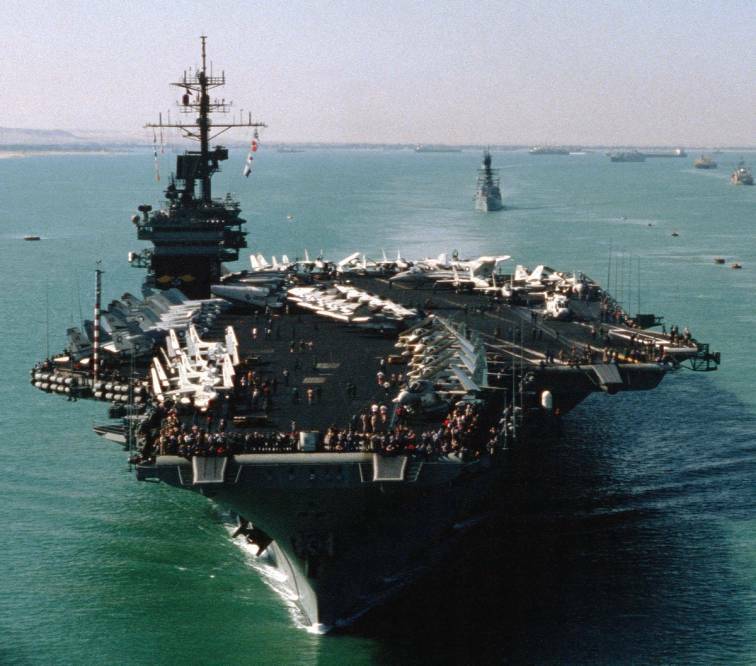 America and elements of her battle group were operating in the Adriatic Sea in support of the NATO Implementation Force (IFOR) in Bosnia and Herzegovina for Operation Joint Endeavor. Secretary of the Navy John H. Dalton visited the carrier on 6 February. Speaking of the carrier's role in Joint Endeavor, the Secretary said "I would like you to know I appreciate the sacrifices you've made. You're actually saving lives. You've brought the warring parties to the peace table. Without you, it wouldn't have happened." 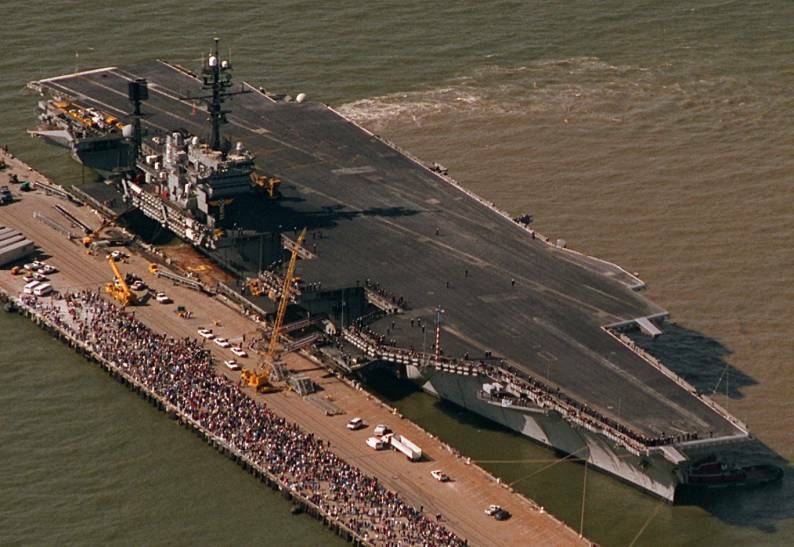 America returned to the pier in Norfolk, Va., ending her Mediterranean Sea deployment on 24 February 1996. 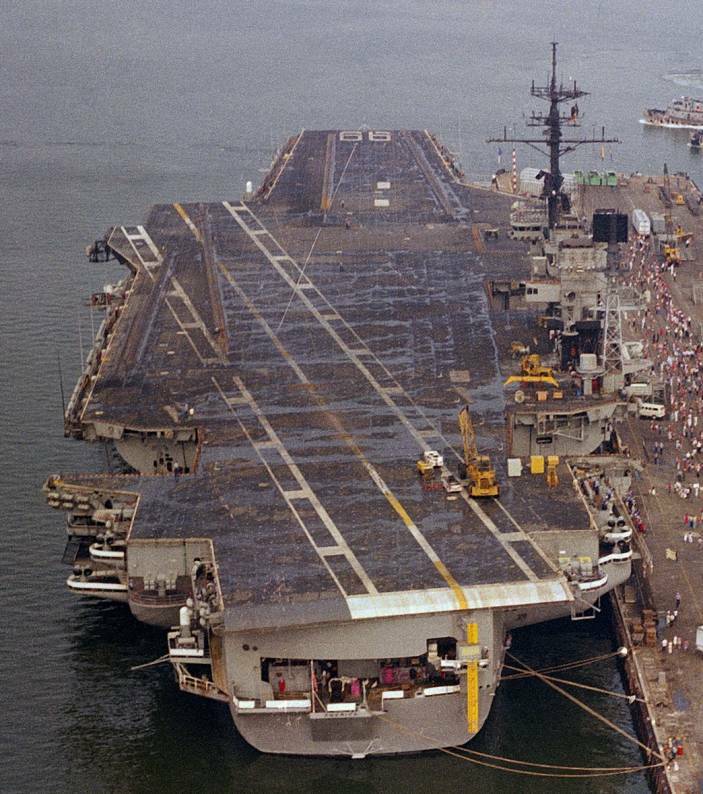 Originally scheduled to undergo a Service Life Extension Program (SLEP) in 1996 for subsequent retirement in 2010, CV-66 fell victim to budget cuts and was instead retired early by the U.S. Navy. 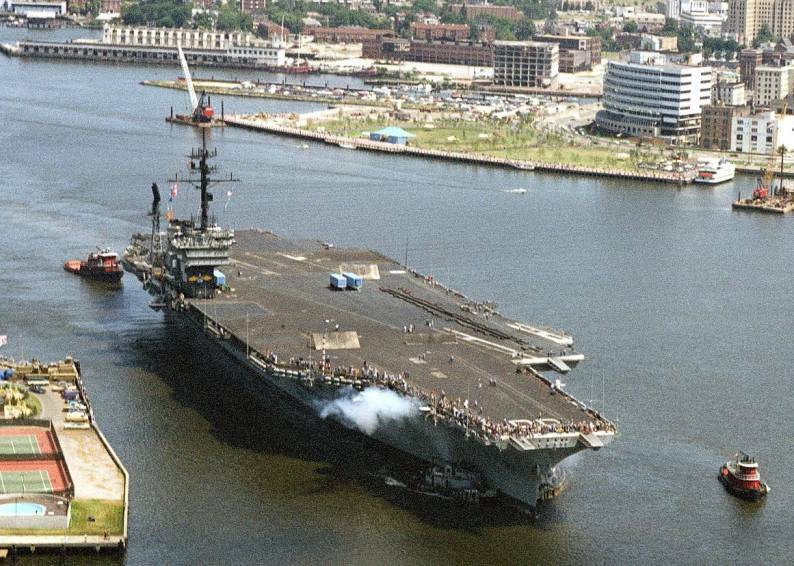 After more than three decades of proud and historic naval service, America was decommissioned in a ceremony at Norfolk Naval Shipyard in Portsmouth, Va., 9 August 1996. 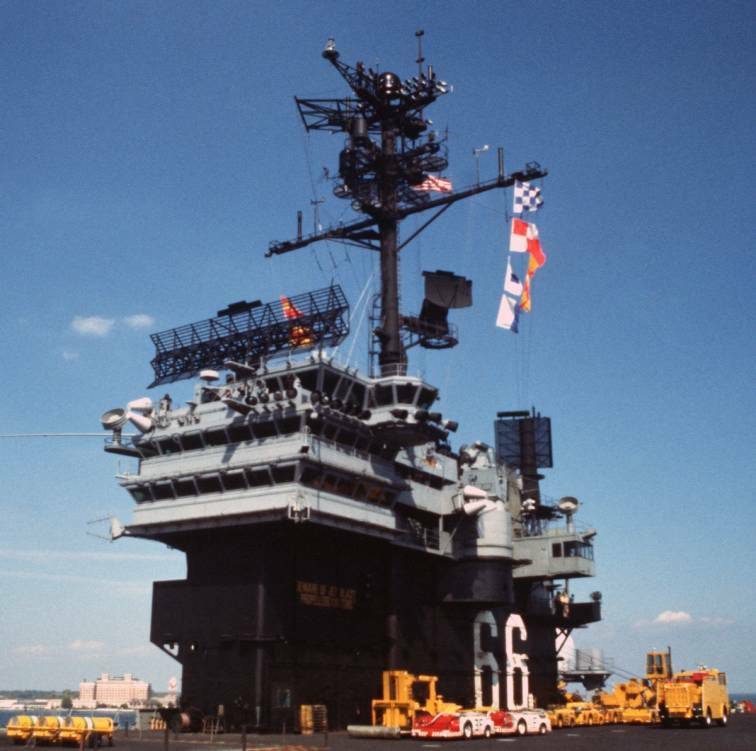 Following the decommissioning, America was stricken from the Naval Vessel Register and was transferred to the Ready Reserve Fleet at the Inactive Ship Maintenance Facility in Philadelphia, Pennsylvania. Though already decommissioned, she was awarded the 1995 Battenberg Cup in recognition of her crew's achievements in her last full year in service. 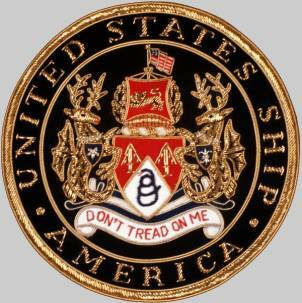 On 25 February 2005, a ceremony to salute America and her crew was held at the ship's pier in Philadelphia, attended by former crew members and various dignitaries. She departed the Inactive Ship Maintenance Facility on 19 April 2005 to conduct the aforementioned tests. The experiments lasted approximately four weeks. The Navy tested America with underwater explosives, watching from afar and through monitoring devices placed on the vessel. These explosions were designed to simulate underwater attacks. 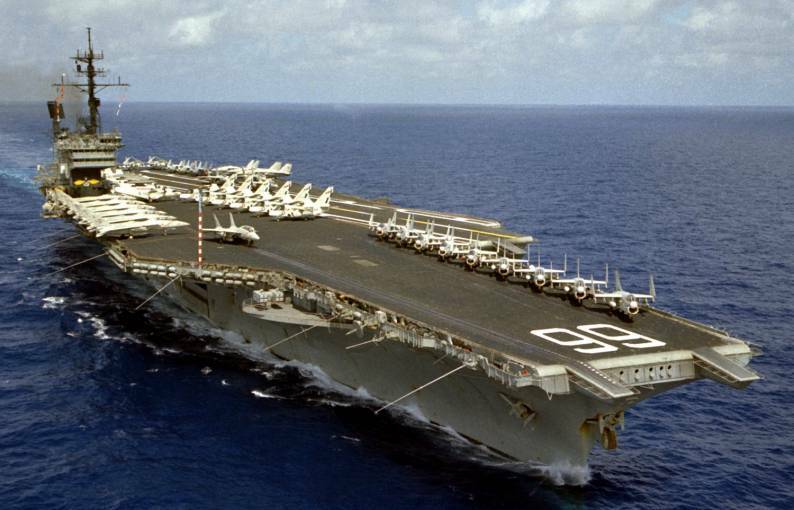 After the completion of the tests, America was sunk in a controlled scuttling on 14 May 2005 at approximately 11:30, although the sinking was not publicized until six days later. The wreck lies upright in one piece 16,860 ft (5,140 m) below the surface of the Atlantic Ocean.